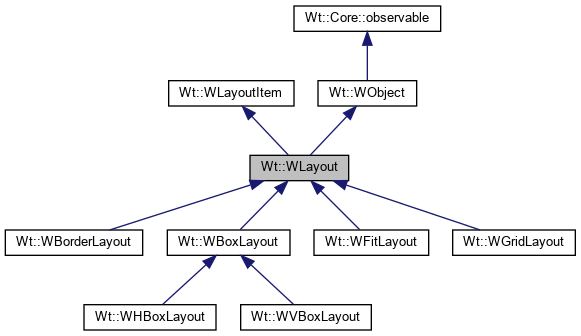 Implemented in Wt::WGridLayout, Wt::WBoxLayout, Wt::WBorderLayout, and Wt::WFitLayout. This method finds the corresponding WWidgetItem and calls removeItem(WLayoutItem *), and returns the widget. Sets the preferred layout implementation globally. Since this is a system-wide setting, and not a per-session setting, you should call this function before any session is created, e.g. in main() before calling WRun(). Set the preferred layout implementation.